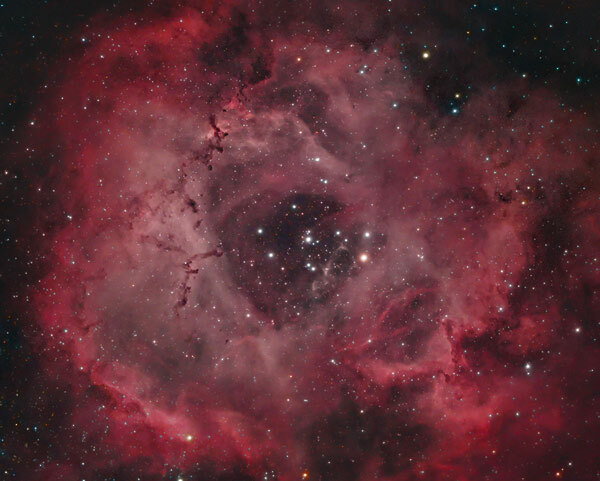 The Rosette Nebula is a stunning astrophotography target for your camera and telescope. The colorful hydrogen gas and embedded open star cluster (NGC 2244) make this winter deep sky target one that is not to be overlooked. If you are looking to photograph this impressive nebula using a camera and telescope, the information and resources on this page should give you a better understanding of what to expect. Over the years, I have photographed the Rosette Nebula many times using various camera types. In this post, I’ll share some fascinating information the Rosette Nebula, and best practices for photographing it through a telescope. Be sure to watch the video of my experiences photographing this nebula from the backyard. This beautiful deep-sky object is a large nebula located in the constellation Monoceros. It is a cosmic cloud of gas and dust that lies approximately 5000 light years away and has a flower-like appearance. 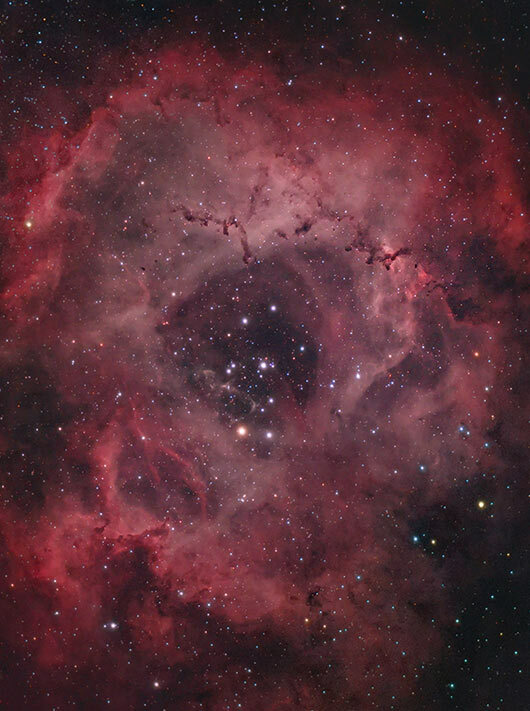 The petals of this rose are actually a stellar nursery where new stars are being born. This nebula has also been referred to as the “skull”, as it resembles a human skull in certain orientations. The striking shape of this nebula was sculpted by the winds and radiation from the cluster of young stars in the center of the Rosette known as NGC 2244. The star cluster inside of the Rosette Nebula was discovered by John Flamsteed in 1690, but the associated nebula was not observed until much later. The NGC 2244 star cluster (Caldwell 50) is much brighter and easier to observe than the surrounding hydrogen gas. To observe the Rosette Nebula visually, you will need to point your telescope towards the constellation Monoceros, under extremely dark, moonless skies. A telescope with low magnification using a wide-field eyepiece is also needed, as this deep sky object is quite large (its apparent dimensions are 1.3°). The pretty red color of this nebula can not be seen through a telescope, it can only be recorded through long exposure photography. With an apparent magnitude of 9.0, this object is an excellent choice for astrophotographers shooting in a light polluted area. 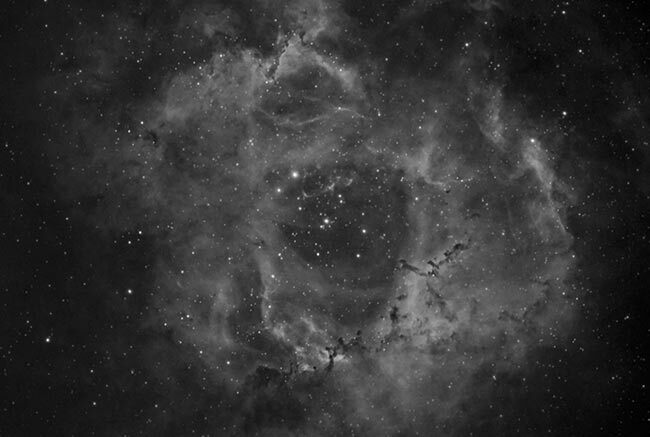 There is no substitute for dark skies, but a light pollution filter can work wonders on the Rosette. The image above was captured entirely from my Bortle 8 sky using filters that block many of the common artificial light sources. For observers and amateur astrophotographers in the northern hemisphere, the Rosette Nebula is a winter target. From mid-northern latitudes, the most favorable time to capture Caldwell 49 is during the months of January and February. It’s available much longer on either side, but these months provide enough time to soak in some serious signal over the course of one night. To find the Rosette Nebula, look to the left of Orion the hunter. 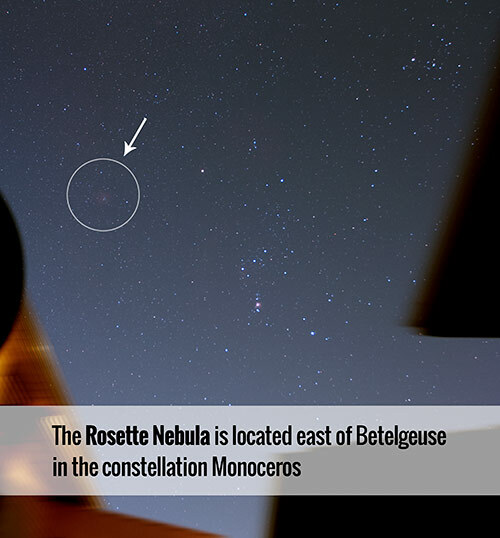 As you can see in the image below, NGC 2244 resides high in the sky close to the bright star, Betelgeuse. With so many fascinating deep sky targets in the winter night sky, the Rosette is a worthwhile subject in a busy night sky. Because the Rosette Nebula reaches so high into the sky from Northern latitudes, you reap the benefits of imaging through an improved sky transparency. 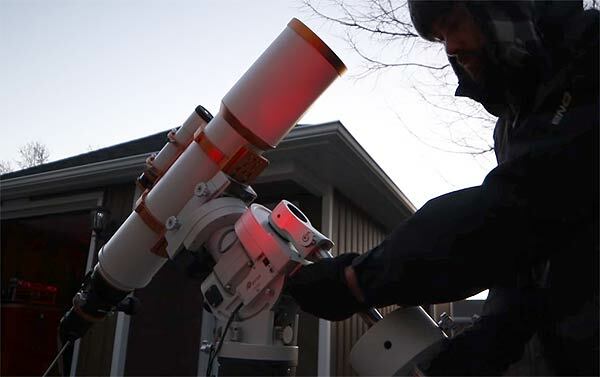 Objects that are a low on the horizon can create headaches for amateur astrophotographers in the city due to heavy sky glow and atmospheric turbulence. The location of this object is also convenient if your backyard has obstructions like tall trees or neighboring houses to shoot over. To photograph images of constellations without star-trailing, I use a small SkyTracker camera mount to freeze the motion of the night sky. This works best with a wide angle lens such as the Canon EF 17-40mm F/4L used for the photo above. However, don’t expect to reveal any details of the Rosette Nebula with a wide-angle lens. You’ll need a telescope with a focal length of at least 400mm for a proper view. This can be a challenging nebula to photograph because it appears in our winter night sky when the nights are cold and unforgiving. In southern Ontario, the months of December through March are often the cloudiest of the year, and that is precisely when the Rosette Nebula is at it’s highest in our night sky. In February 2018 I photographed the Rosette Nebula from my backyard using a larger refractor telescope and a DSLR camera. The William Optics FLT 132 is an incredible instrument for astrophotography purposes due to its large aperture and high-quality apochromatic optics. The telescope used in the video above has a focal length of 925mm. When coupled with a crop-sensor DSLR like the Canon EOS Rebel T3i, the Rosette Nebula fills the entire field of view. This should give you a good idea of how big this nebula really is. For a wider look shot of this large object, consider using a full-frame camera with a wide field refractor telescope. Processing an image of this nebula can be a lot of fun. The intense colors and bold features of this H II region can lead to a rewarding result. Have a look at my image-processing tutorial on my where I stack and process an image of the Rosette Nebula using DeepSkyStacker and Photoshop. This video is quite old now, but many of the image processing strategies I use in Photoshop are still widely used and enjoyed today. The data was captured using a stock DSLR camera (Canon EOS Rebel 450D) from a dark sky site. In the video, I combine a number of full-color light frames and stack them using DeepSkyStacker. I then take the image in Adobe Photoshop for image processing to really bring out the color and detail of this deep-sky wonder. To add even more of a “punch” to this target, consider shooting some additional details using a narrowband Ha filter. The Hydrogen Alpha details of my image were shot using a DSLR ha filter. The Astronomik 12nm clip-in ha filter covers the sensor of my Canon EOS Rebel T3i to produce grayscale images in the isolated h-alpha wavelength. This can be very useful when boosting your luminance details of an astrophoto. To learn how to add narrowband Ha details to a color photo, please see my HaRGB photoshop tutorial. This tutorial includes a video where I walk you through the steps of using the h-alpha images as a synthetic red channel and luminosity layer. This technique works especially way on hydrogen-rich nebula. The process of adding a luminance layer in the h-alpha wavelength was also used on this image of the Heart Nebula in Cassiopeia. When it comes to winter deep sky astrophotography targets, the Rosette Nebula is hard to beat. It often gets overshadowed by the widely renowned Orion Nebula in January and February, but your results can be just as rewarding. Also, you don’t need a modified DSLR or dedicated astronomy camera to enjoy the Rosette. A stock DSLR camera will reveal the beautiful red petals of the Rosette just fine. If you are lucky enough to own an astro-modified DSLR or cooled CMOS camera, give it a shot using a narrowband Ha filter. I think you’ll be absolutely blown away with the outcome.